Mexico has 31 states and one federal district, all of which issue their own license plates. Since the 1990's, each state has issued unique graphic plates depicting different themes. Several of the plates issued around 2010 incorporated the "Mexico 2010 Bicentennial" logo, symbolizing 200 years of independence from Spain. Issues from recent years have started using QR codes on the plates. Mexico issued its first license plates in the early 1920's - each state (and some cities) issued different plates. In 1933, plates were standardized, and each state issued identical-looking plates, bearing the invidual state name. In 1937, plates became federally issued, and they all had the "Mexico" legend. In the 1940's, the state of origin was usually identifiable by a prefix letter or letters. The federally issued plates continued until 1946. Starting in 1947, the state name returned to plates, and each state again issued a standard plate which looked the same as the plates of all the other states. The designs, sizes, and styles changed every year, and in 1954 the first 2-year plates were issued for 1954-55. For the 1956-57 issue, the North American standard size of 6 x 12 inches (150 x 300 mm) was adopted. Biennial plates continued up to the 1984-85 issue, with the standard AAA-000 numbering sequence for passenger plates starting in 1972. Also starting in 1972 was the issue of "Fronteriza" plates - these are used in states which border the USA for cars registered within 20 miles (30 km) of the US border, and they indicate that different taxes/fees have been paid. 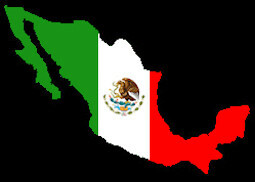 Fronteriza plates are also available in Baja California Sur. In 1986, undated 5-year plates were issued; these were used until 1991. In 1992, new reflectorized plates were issued, and 7 characters were now used, passenger plates using an AAA0000 sequence. Graphic plates started appearing in 1995, and became prevalent by 1998. These also used the AAA0000 numbering sequence for passenger plates, and are generally known as the "First Generation" graphics. In 2001, smaller dies started being used for the serial number, and passenger plates used dashes: AAA-00-00. These are the "Second Generation" graphics. Several generations of graphic plates later, in 2013, the numbering is changing. Most plate types are replacing one number in their sequence with a letter, which will more than double the number of available combinations. Passenger plates now become AAA-000-A. Quintana Roo was the first state to utilize the new numbering, starting with cars and private trucks in late 2012. Currently, most states do a replate (completely replace all plates on the road) every 3 years, but this practice varies, as some states are unable to replate due to governmental or public opposition to the process or the fees involved. Today, each of the 31 states plus the Distrito Federal (CDMX) are all issuing beautiful graphic plates incorporating both traditional and modern graphics and designs. Some states even have different designs for each type of plate (passenger, truck, taxi, dealer, etc), so there are an incredible number of license plate designs currently visible on Mexican roads. In 2016, the Distrito Federal was renamed to 'Ciudad de México'. New plates bearing the CDMX logo (with the MX in this interesting pink color) started appearing in July 2016. Starting in 2017, several states have made changes to their existing baseplates to adhere to the new license plate standards put forth by the SCT (Secretary of Communications and Transport). Most notably, this involves removing all graphics from the center of the plate so the serial number is clearly visible. Some states like Jalisco and Chihuahua have gone to an extremely simple plate design for 2017, but others like Durango have followed the rules but still have an interesting and colorful plate. While some states have created completely new plate designs, others have opted to modify their existing plates to conform to the new standards. As of early January 2019, Tamaulipas has finally issued new plates, and Coahuila has also issued new plates (continuing the 3-year replacement cycle). We are still waiting for new plates from Michoacan and Puebla. Images and content from this web site may not be used on any other web site or in any other publication without my explicit permission.